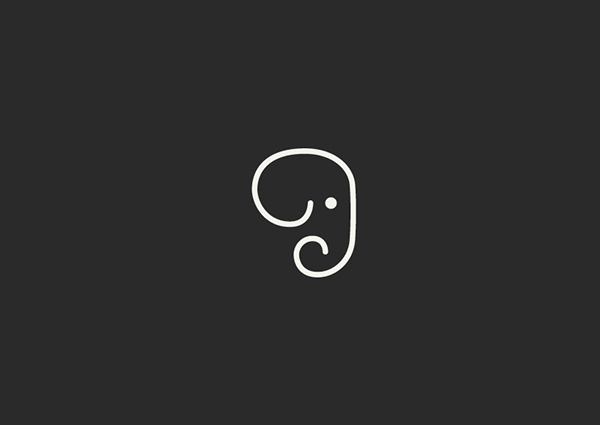 A good monogram for Elephant Book Company, a firm that was originally located south of the River Thames near Elephant & Castle (hence the name). Designed by Paul Palmer-Edwards of London-based Grade, I was told it was one of those eureka moments, done quickly without much else to show (not that anything else is needed). Love it- simplicity is where it’s at. Love those eureka moments when the right logo just hits you. Amazing how just a few well chosen curves suggests the full head of the elephant. Will scale down beautifully too. Jealous! Indeed simple and perfect to me. Jealous too. A pity that Grade wasn’t asked for designing (or at least templating) the elephantbookcompany.com website (apparently). They should use its force and build some brand identity around it. Lovely, but completely agree with Paul about the website. What a shame. Lovely design… simplicity at its best! Would’ve been nice if the aperture had started with a slant similar to the final (end of trunk), but aside from that, I like it! Accomplishes its purpose with elegance. Would be nice to see it used in printed/digital work (so much potential), but unfortunately, after looking at the website, it stops short. Nonetheless, still great work. And although the stroke-weight variation really gives it a “tusk” feeling, Wei Yew’s design for Edmonton Zoo does look dated. They already have a new, rather poorly designed logo to prove it!